The Passover Potluck is a unique annual online event. I’ve invited my friends, both Jewish and non-Jewish, to share recipes that are kosher for Passover. My goals are simple– to foster mutual understanding between different cultures, to introduce you to my foodie friends, and to share yummy recipes and cooking ideas for Passover! To learn more about the Passover holiday, click here. To learn about what makes a recipe kosher for Passover, click here. To check out the other Passover Potluck recipes, click here. Hello guys and dolls, Louise here from Geez Louise! You might say I’m a little June Cleaver meets Betty Paige. I’m your modern day 1950’s housewife cooking my way around Los Angeles in stilettos and red lipstick. With a flower in my hair and a chef’s knife in my bag, I work as a professional chef, food stylist and media spokesperson. My food blog is where you can find me dishing up classic American comfort food with a modern twist. I flip for meatloaf and mashed, believe that grilled cheese sandwiches & tomato soup can turn your frown upside down, and that homemade chocolate chip cookies keep kids off drugs. I inherited my love for food and my vintage style from my parents who were a product of the 1950’s. I also adopted an intimate understanding of Judaism from my parents, who converted over 20 years ago. Through the years, I have had the pleasure of studying the Torah with my father and have observed many Passovers. I have always been mesmerized by the spiritual symbolism and thoughtful detail put into the preparation of the Passover meal. It was a treat for me to meet The Shiksa this last Thanksgiving, and now my pleasure to participate in this online Passover Potluck. 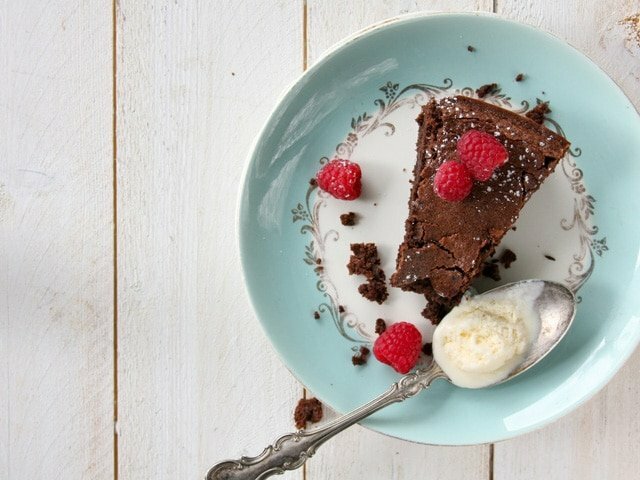 Learn to make a flourless chocolate hazelnut cake for Passover with this kosher, grain-free recipe from Chef Louise Mellor. Dessert, Kosher, Dairy. Preheat the oven to 325 degrees and adjust the rack to the middle of the oven. Cut a 9 inch circle of parchment paper to line a 9 inch spring form pan. Lightly, with nonstick cooking spray, spray the bottom of the pan, place the parchment into the bottom, and then lightly spray again, (spray-paper-spray) and set aside. Melt chocolate over water in a Bain Marie, stirring constantly to prevent burning. Once the chocolate is melted, set it aside to cool. Add the egg whites to the bowl of an electric mixer, attach the whisk. Begin to whisk the egg whites on medium speed until they become bubbly and foamy. Then increase speed to high and whisk egg whites until they just begin to become soft peaks. Gradually add in 1/3 of the sugar and continue to whisk for an additional minute. Eggs should be in between soft and hard peaks. Using a spatula, gently remove egg whites and transfer them into another clean bowl – set aside. In a bowl of a food processor, pulse the hazelnuts with the powdered sugar, cocoa, and salt to form a fine, sand like mixture. Do not overprocess. In the bowl of the electric mixer, combine the butter and ¾ cup of sugar. With the paddle attachment, cream the butter and sugar on medium to high speed until light and fluffy. Beat in the Hazelnut Paste (recipe below), scraping down the sides of the bowl with a spatula – mix until well combined. Add in the yolks one at a time and mix until combined. Mix in the espresso, hazelnut liqueur and vanilla extract, followed by the melted chocolate – mix until just combined. Gently fold in the hazelnut mixture from the food processor. Fold in the egg whites in thirds until just combined – do not over mix. Place the batter evenly into the prepared pan and bake for 50 - 55 minutes. The finished cake will be slightly cracked and puffy. Once removed from the oven, the cake will fall in the middle (don’t worry, it is suppose to). Allow to cool slightly then place into the refrigerator to cool completely and become firm (at least 4 – 6 hours or overnight). Do not try to unmold or slice while warm, the cake will fall apart and appear uncooked. 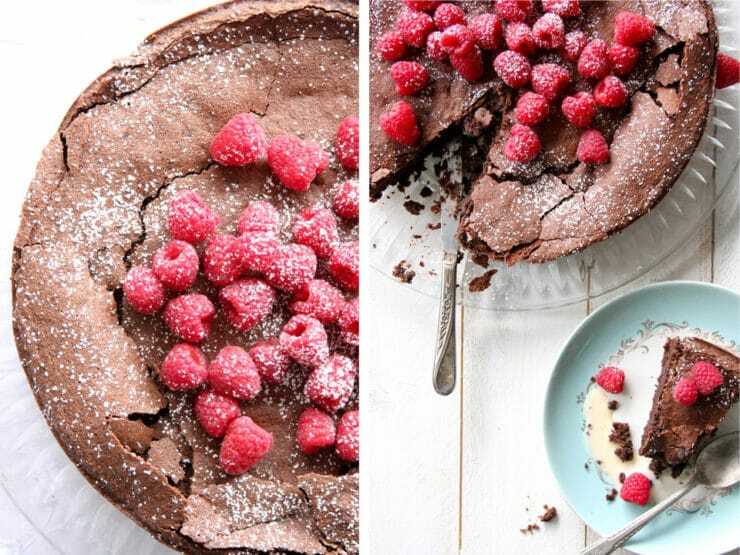 Unmold the sides, serve with vanilla ice cream and raspberries – garnish with Passover Powdered Sugar. In a food processor, finely grind the nuts until mealy. Add egg whites, confectioners' sugar and liqueur. Blend until paste forms. Wrap and store in a covered container, up to 2 weeks. Regular powdered sugar contains cornstarch, which is considered kitniyot (some Ashkenazi Jews will not eat kitniyot during Passover). You can purchase Passover Powdered Sugar at many kosher markets. To make your own, in a food processor, combine potato starch and sugar (according to amounts above). Process until mixture is very powdery and resembles confectioners' sugar, about 2 minutes. Allow to settle for about 1 minute before removing processor cover. Let me first start off by saying I made this yesterday and it was absolutely delicious!! Thank you so much Tori! 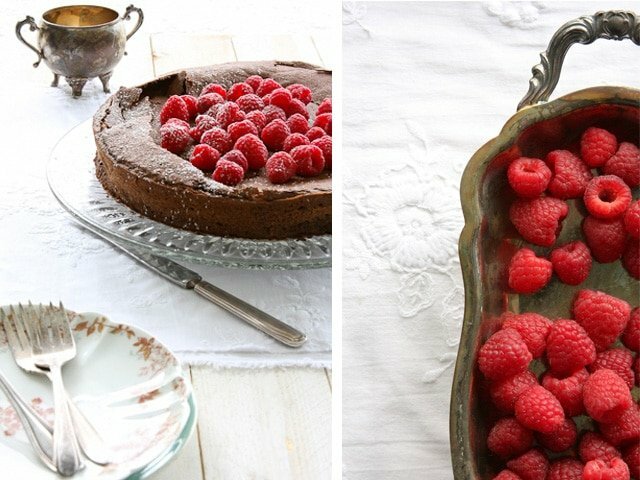 I’ve made several of your recipes through the years and have never been disappointed :). That being said, I would like to bring a few things to your attention. I don’t see how the prep time of 15 minutes is accurate. Even with help, it took me well over 45 minutes. In addition, the amount of salt needed is not listed and also missing is when to add the hazelnut liquor into the cake mix so I added it with vanilla and coffee. Other than that, it was a hit and I will be making it again! Thank you very much for the feedback Portia! I have made adjustments to the recipe based on your notes and added the salt back in. My recipe software was recently updated and I had an assistant pulling over the recipes one by one, she must have accidentally left it out. Glad you enjoyed the cake regardless! The recope looks great! Does this freeze well? Or keep well in refrigerator after bakung? Hi! Love this recipe and want to try it for this Passover. Can you tell me what the difference is between toasted and roasted hazelnuts?? Thanks! Where do you get hazelnut Kosher for Passover liqueur? AliB, if you have a well-stocked kosher market locally they should be able to direct you to a brand. I know Bartenura makes one that is KFP. If you have trouble locating one you can replace it with an almond liqueur or just omit. Thank you for this recipe! And i love your blog. Do you have any hints on what to do with all that extra hazelnut paste (other than just eat it (’cause it is just that good)? amazing, its perfect especially that my mother-inlaw eats gluten free. You had something similar last year, that I made her throughout the year as well. Louise & Tori — I am LOVING this post! My absolute favorite sweet combination — chocolate & hazelnuts! The perfect marriage of flavors! What a beautiful cake! Lovely! Since it’s flourless, is it also gluten free? I think my sister in law would LOVE this recipe, but she has a gluten allergy. Do you think this could be made effectively with margarine? I always prefer to use butter but I’m going to a non-dairy seder. I have used Mother’s parve, Kosher for Passover margarine in my Passover cakes for years, because I also go to a strictly kosher Seder where meat is served. No one has ever complained about my cakes!